Scara Brae on Skoll Bay was a site that beckoned this researcher to discover the stone habitat of people living on the shoreline nearly 5000 years before. Visions of life in those small, stone dwellings were confirmed when we visited Orkney. 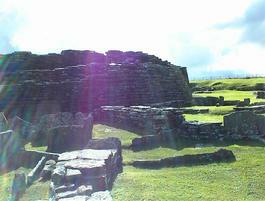 This author was shown visions and told about a lifetime in ancient Orkney at the Broch of Gurness. I asked my guide in Spirit "to prove it to me" and quickly turned, taking a picture of the Iron Age settlement. This hue of purple covered the wall. Visions of a distant land and a Past Life Regression in the Bahamas inspired this author to investigate the Scottish Isles with emphasis on the Orkneys in 2004. Validations and messages from Spirit seemed to fill the days of our travels there. I was shown a location in visions and then visited them. 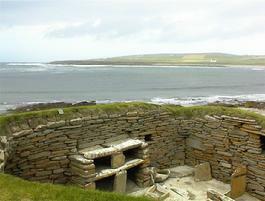 Spirit would inform me about the history of sites such as Maes Howe, a Neolithic cairn on Orkney. That location was shown to me in visions and then described in detail as structure that served as a landing craft beacon during certain times of the year with an open lid that was no longer visible. The Isles were enchanting and the double rainbows were invigorating. Then energy at Orkney proved me with daily challenges to my senses that seemed so familiar and the stories from Spirit about life times there mirrored or complimented the known history. The Dwarfie Stane was said to date back to 3000 B C. Years earlier my friend admitted to me that he had visions of living in such a stone hut with a wild cat as his friend. He worked with herbs and was using that information to keep himself alive for over a decade since his original diagnosis of lung cancer. I felt his Spirit come in, trying to communicate with me, when I was on Hoy where the Dwarfie resides. He showed me scenes of another time and I knew that was why I chose this obscure spot to visit on that short excursion to the Orkneys. The Ring of Brodgar was a fascinating site. The double rainbows added to the mystery. And I stood on the shoreline near the standing stones I heard Spirit tell me that William was buried in one of the mounds pictured here near the ring. Later when we visited other Historic Scotland locations validation was received when the guide discussed the theories on the mounds and their existence. Scara Brae had beaches and views that beckoned to me. Details of lifetimes there were scarce but seemed to mirror the archeological evidence. In Spirit Communication I have found that past life experiences are often detected through clairsentience; a feeling of familiarity. Experiencing this ancient civilizations through their ruined sites was emotional and uplifting; a feeling of being a courageous pioneer in an ancient world enveloped me.